has propelled Zambia into the limelight for those travel hungry subscribers that enjoy some of the finer things in life with a big side-order of adventure. it manages to grab your heart and forever holds a little place in it. and �The Dog House� which sits on elevated stilts overhanging the Zambezi itself. All rooms enjoy spectacular views of the Zambezi or are nestled away for that secluded hideaway feel. and Tujatane (the Tongabezi Trust School). If you are still craving more action � then take a helicopter or microlight flight over Victoria Falls, or even try white-water rafting. Government and stakeholders have been urged to explore the tourism potential on Lake Tanganyika in Mpulungu District to positively contribute to the growth of the sector. Mpulungu Habour Authority (MHA) manager, Dennis Kaluba said there was need for all stakeholders to explore the tourism potential on Lake Tanganyika, the longest fresh water Lake in the world and surrounds Zambia, Tanzania, Burundi, and the Democratic Republic of Congo (DRC). Mr Kaluba said if explored, Lake Tanganyika could contribute to the growth of the tourism sector in Zambia as it had more than 350 species of fish. He said the fish on the Zambian side had been depleted due to poor fishing methods and that only exotic ones were remaining. "Lake Tanganyika is a fresh water body which is beckoning investment in tourism. The water body has more than 350 species of fish of which most are exotic, including the gold fish which is beautiful to look at," he said. Mr Kaluba said the lake had a number of bays around it which could attract tourists across the world. He further said modernisation of the infrastracture at the habour was progressing well, and that the consultant engaged was expected to conclude the detailed engineering designs early this year. Mr Kaluba said Government recently procured ultramodern equipment at a cost of US$5 million which would be installed at the habour. He said the port currently had three folk lifts, a reach stacker and a crawler crane, and was now able to handle containers going out of the country. 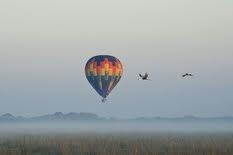 Wilderness Safaris has reintroduced its seasonal offer of free hot-air balloon safaris for guests visiting Busanga Plains in Zambia�s Kafue National Park in August, September and October. The offer applies to all guests staying for three nights or more at the Shumba or Busanga Bush Camps. Guests will also receive a 50% discount on flights to and from Kafue from Livingstone or Lusaka. 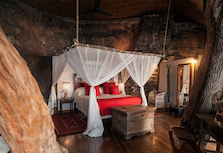 Wilderness Safaris� Shumba Camp has six luxurious safari tents on raised platforms overlooking the surrounding plains. The large en-suite tents are served by a central raised dining and lounge area. Busanga Bush Camp hosts four well-appointed Meru tents. Zambia offers a visually enthralling array of beautiful scenery and diverse wildlife, but for those who need to pump up their adrenaline, there are plenty of daring escapades to undertake within the country. An of course, there are more tranquil activities for those who prefer to soak in Zambia's relaxed atmosphere. Amidst the tracks and spoor of Zambia's wildlife, experience the excitement of tracking elephant or buffalo with an experienced guide &endash; perhaps heading into unknown territory and encounters of an extraordinary kind! Canoeing on the upper Zambezi affords the wildlife enthusiast a relaxing means of experiencing an "up-close" view of Africa's big animals without disturbing them. Canoes also operate on the picturesque network of rivers in the Kasanka National Park. Two-person fiberglass canoes are an excellent means of enjoying mountainous escarpments and Zambia's lush riverine bush &endash; no experience required! One of the best &endash; and most thrilling! &endash; ways to appreciate the magnificence of the Zambezi's path through the Batoka and Songwe gorges, white water rafting is an unforgettable roller-coasting adventure through rapids and towering cliffs! Lake Kariba is ideal for a tranquil experience along the great Zambezi's 220 km of river. The water's edge provides an exquisite opportunity to view bird life and the game that come down to drink. The newest high speed adventure to feature on the Zambezi: jet boating. Hi-speed jet boats propel you over the rapids and launch you through the gorges. Along with great game viewing and birding, many of the National Parks offer waterways with excellent fishing opportunities. The Zambezi has produced record tiger fish, while Lake Tanganyika is infamous for the Nile perch and Goliath tiger, which can weigh up to 35 kg.! Spectacular golf courses abound in Zambia. There are courses near Livngstone, Kasaba Bay, Mufulira, Chingola, Kitwe and Ndola. For a golfing thrill, try the acclaimed Lusaka Golf Course, which is on the circuit of the annual PGA Safari tour. Lake Tanganyika and Lake Kariba provide superior opportunities for boating, sailing and other watersports such as water skiing and windsurfing. Victoria Falls is not for the timid! Some of the highest and most spectacular jumps can be experienced here. African Extreme operates a completely safe excursion into the thrills of free-falling from the Victoria Falls bridge every morning, no bookings necessary. Imagine spreading your wins over the white mist of Victoria Falls or soaring like an eagle, above buffalo and elephant as they graze on the lush islands of the great Zambezi River. You can experience this beauty from a micro-light aircraft!